EARLY BIRD PRICING EXTENDED! SAVE $300 UNTIL MAY 1! Early bird discount decreases to $200 off starting on May 2. Full price starts June 1. Our lives can be overwhelmed with the details of daily living. The amount of information being directed at us on a daily basis is never given an opportunity to be digested, assimilated and ultimately eliminated. Life can be lonely for the soul when our lives are too busy just existing. Who can pause enough to make space for being insightful to our deeper longings? There is profound desire to belong not just in our various roles, personalities or identities but to the deeper inner landscape of our soul—the willingness to open and reveal that essence of our inner light. Come away to Ireland and share in a retreat that promises to inspire your spirit of wonder and adventure, and yet nourishes your sweet soul, as it reconnects to self. Ireland is home to magnificent green countryside, gorgeous cliffs, communal pubs, and legends of faeries and leprechauns. For many, Ireland also holds the key to ancestral roots and cultural heritage. Enjoy the natural beauty, history, and lore of Ireland while partaking in an unforgettable yoga experience with Laura Jane Mellencamp. Explore Ireland through hiking the trails around the Co. Clare countryside. 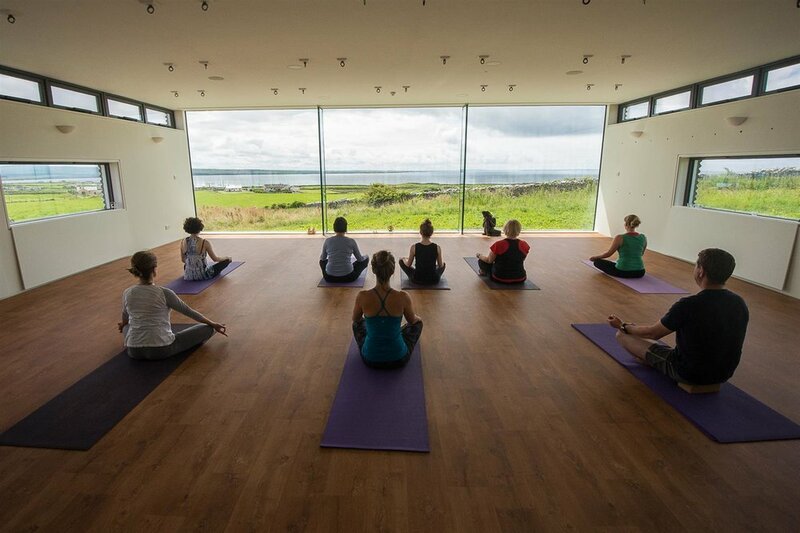 Partake in daily yoga practices of asana and deep meditation spiced with the beauty of poetry — all while overlooking the awe-inspiring, rugged Cliffs of Moher facing the shimmering, expansive ocean. Dine on mouth-watering, abundant homemade vegetarian meals that will delight your palate. Share in an evening sanga before drifting off to sleep by the sound of the waves breaking on the cliffs. It’s a mystic place of profound beauty that nourishes the soul!! Using the practice of meditation, Laura Jane has designed this week to support you in exploring the tools of stilling the mind and embracing your authentic self. The yoga classes will blend the disciplines of various styles of Hatha yoga with the mindfulness of meditation. They will cover the fundamental principles underlying the therapeutic application of yoga and how to incorporate these principles into your practice. Work to dissolve old blockages, unravel samskaras, and create new pathways to vibrant health and happiness. The end result will be one of the most incredible, unforgettable yoga experiences you will ever have. This week is a perfect balance between rest and play. Laura has discovered through leading and attending many retreats that traveling together and saying yes to life and its opportunities in the moment create lasting friendships and a gratitude for life’s abundance that will last forever. This yoga retreat is for all ages and all life experiences. It is perfect for all levels of practitioners, yoga teachers, and bodywork therapists. Private yoga sessions will also be available. Usually there is one dedicated “excursion day” in which we do not hold yoga and meditation classes. This is a day to take take advantage of some of the more involved tour and excursion offerings and is always a lot of fun! A more specific itinerary is sent out via email 2 or more weeks before the retreat starts. A trip to Greece had been on my “bucket list” for many years. The experience with Laura Jane in Amorgos was beautiful, peaceful, and exceeded my expectations about visiting Greece! We practiced well thought out yoga classes twice a day, and still had plenty of time for outings on the island, or time to relax by the pool. The group was a true sangha, community, of friendly open people. Old friends reconnected, and new friends were made by each yogi. I feel confident about traveling with Laura Jane and through True Nature again!